Northants are under pressure in their County Championship Division Two game at Gloucestershire after Chris Dent and Michael Klinger batted the hosts into a commanding position on the second day at Bristol. By the close, Gloucestershire had reached 240 for four in their first innings to lead by 64 runs, with Dent (93) and Klinger (62 not out) having shared a third-wicket stand of 137. Gareth Roderick contributed 40. The morning session had seen Craig Miles claim the last three Northants wickets as they progressed to 176 all out from an overnight 134 for seven. The visitors initially put up some resistance and Steven Crook moved to a 69-ball half-century, with nine fours, as the first half hour passed without a wicket falling. Richard Gleeson helped take the score to 161 before getting a leading edge off Miles and lobbing a catch to mid-on. Miles struck again soon afterwards as Crook attempted a forcing shot off the back foot and got a thick edge to Dent at backward point. Shaw, the 20-year-old on a season-long loan from Yorkshire, would have claimed his maiden five-wicket haul in first class cricket had Graeme van Buuren held a chance dropping over his shoulder at point offered by Muhammad Azharullah. In the following over, Azharullah holed out to mid-on off Miles and Northants could reflect on a miserable batting effort. Miles’ figures meant he has taken 13 wickets in four innings this season since missing the first three Championship games through injury. Gloucestershire were 40 without loss at lunch, Roderick having been dropped on 16 by wicketkeeper Adam Rossington off Gleeson, and the pitch was being put into perspective. The Gloucestershire captain helped take the score to 76 before pushing half forward to Ben Sanderson and departing lbw. Gleeson removed van Buuren for 13 to another leg-before decision with the total on 100, but Dent was unbeaten on 53 at tea, having reached a solid half-century off 122 balls, with five fours. At 145 for two, the home side trailed by only 31. The final session was dominated by Dent and Klinger in glorious sunshine. The pair produced some positive strokes all around the wicket. Klinger, in his first Championship innings of the season, was uncharacteristically loose at times, but rode his luck to play a typically key role. By the close he had faced 139 balls and hit eight fours and a six. 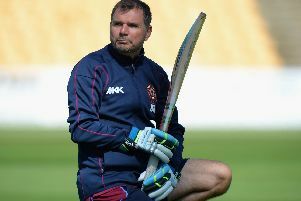 Northants’ problems increased when wicketkeeper Rossington was forced to leave the field with a finger injury, Ben Duckett taking his place behind the stumps. But they had two late successes. Dent, having faced 233 balls, fell to the leg-spin of Seekkuge Prasanna, Richard Levi taking the catch, and Hamish Marshall quickly followed to Gleeson for a duck.